We have reached the end of the journey now. It's my Anniversary today! Hence, was my wedding day 3 years back. I will try and narrate the story through my pictures here. Thank you everyone for commenting daily and appreciating what you saw! It never gets old (always makes my day)! 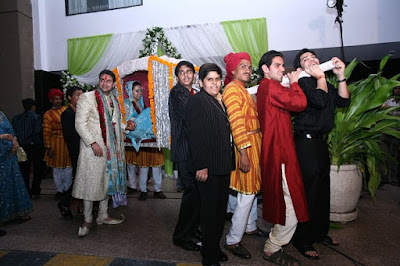 This is what you can call the Indian version of 'walking down the aisle'. Mostly the Indian Bride walks with her friends and female cousins by her side. But since I am a 'Daddy's Girl' to the core, I wanted to walk with my Dad. P.S. He is looking so tired here [it's about 10pm] 'coz he [and my mom] hadn't had a drop of water or any food all day. This is a custom that requires parents to fast till they don't 'give their daughter away'. All our customs and rituals have stories/reasons behind them. They are not 'a law' or 'compulsory' but if you follow them, it's supposed to be auspicious! Oh! This is one of those Glamour Shots! We had finalized my husband's [fiancé then!] sherwani back in May, when he had come down from U.S. for the Roka & Engagement Ceremony. I simply decided to match my outfit to his! Lehnga is my least favorite outfit out of all the Indian Outfits [don't know why!] and since it's least likely I will ever wear it again I thought I will just follow the norm and wear it on my wedding day [I had already exhausted all the other options for other ceremonies!]. 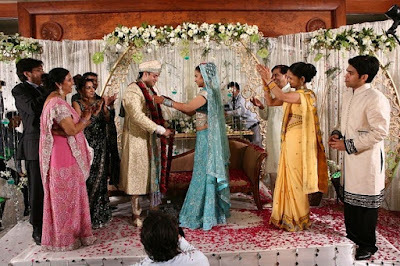 The basic idea behind my Wedding Lehnga [Designer - Neeta Paul] was it should match my husband's outfit, be flowing with intricate 'paisley' work, and light enough [I had to wear it for almost 10 hours!]. Later, we did not sit on the stage and click pictures with all the guests. Instead after the ceremony we got up and walked around the banquet hall 'just like normal people' and met all the guests and clicked pictures in person, on the ground! That felt much more human to me than to sit in one position for hours like statues! This is a chariot of sorts called 'Doli'. In olden days when there were no cars or transportation, the brides used to go their 'new home' in this [which was usually from one village to another]. However, today this is only done for the sake of restoring an old tradition, so the bride goes from the venue till the car in the 'Doli'. These are my brother and cousins giving a hand in lifting the Doli! The only way I was willing to get married was - If things were run my way! Until I got married I never really thought I would! Not 'coz I do not believe in the institution but 'coz I never thought I would ever find someone willing to 'bear my natak!' [tantrums! ;)]. the first pic is very beautiful and it's so romantic that today is your anniv and the post came out today, the whole account was beautiful and moving. May you have a wonderful day and year. That first photo is my favourite one too! You look divine!! You may not like wearing that style of clothing very often, but that outfit is absolutely beautiful!! I really love it all! Thank you so much for sharing all of the photos, experiences and traditions! I feel like I've learned a lot about your culture by you sharing all these stories, and that's great because it's really not something I have any expertise in! It really makes me want to go travel the world even more! Is there any better way to learn about someone else's culture than by experiencing it? I think not! And I LOVE lehengas! They are my FAVORITE type of outfit! So naturally, though this was your least fave outfit, this was my favorite of all the ones you have shown so far! Oh and I like the fact that you came OFF the stage to take pictures. I think it's horrible that the bride and groom sit for hours on end with frozen smiles while people come and take pictures! Awww, you look so pretty. I love how you matched outfits with your husband. The blue lengha looks stunning on you. I decided ages ago that I want a Doli for my wedding. I think it would be fun to be carried around and it's such a fun tradition. First up Happpyyyy Anniversary darling! Wishing you many many years of togetherness and more importantly happiness :) Love the wedding saga pics, a little sad you are all out :( But the finale is most fun. What's amazing is that you look like you genuinely smiling in all your pics unlike most brides who look dead tired and have a fake smiled plastered on their faces. Also love that you guys mingled with the crowd instead of standing on the stage, it looks and feel so artificial, plus those three minute conversations with all the guests! Wierd! Happpy Anniversaryyyyyy!!! Third year is the lucky one...and May you both always be blessed with khushi, pyaar, and luck! Can't wait to see you both!! I am not a wedding person. Much to my parent's disappointment. I love marriage but weddings are not my thing. But reading your account... I'm feeling strange pangs of... wish I did... despite being so sick, your wedding was pretty much perfect. Its like witnessing the whole thing just how it happened babe. A very Happy Anniversary to both of you. Ashi kaa jawaaab nahien. (Sp his smile)This color looked fabulous on you.Make-up,Jwels,Lahenga all r simply gorgeeeeee. Ppl here r enquiring for another party !! May you have a Happy life throughout.Have fun.Bless you. Tans sweetheart, this has to be one of your BEST posts! I LOVE the way you have taken everybody with you down memory lane...I think everybody who has been following you felt a part of your wedding celebrations! I loved the way you have described all the traditions...the rituals...your clothes and why you chose them...I must say very well written posts...Bravo! I wish you and Ashish a very very happy wedding anniversary...May there be many many more happier ones in the coming years...Lots of best wishes!! Lotsa Love & best wishes! Happy Anniversary, Tanvi! Thank you so much for this voyage through your wedding. I learned so much and the beautiful pictures are so enjoyable. I love all your outfits (including the Lehnga! ), but I think what intrigued me most were your delicately painted henna hands. Happy anniversary to the both of you! It's been wonderful to read your recap of the wedding, and isn't it lovely to look back at all these pics and beautiful memories? Oh and that first pic of you, so glamourous, darling!! Happy anniversary, and thank you so much for stopping by G&G! I am so glad to have found you...I loved this post! Interesting, the walking around the fire. Greeks do a wedding walk that includes three rotations. Would you consider doing a guest post on my blog about the symbolism of the bracelets and the henna? I am fascinated by both. Happy anniversary!! love the third pic where u are resting ur head on his shoulder..u look so pretty in the first pic, straight out of a black and white movie. And I love ur doli!! Once gain, congrats..lots of love!! Indian bride looks the best of all... that lehenga suits you...and you are beautiful. Enjoy a happy married life and a belated "HAPPY MARRIAGE ANNIVERSARY"
Happy anniversary sweetheart!!! great selection of pics and rem how much we enjoyed that evening..u were a fantastic bride--looked beautiful!!! i still have memories of all the fun that we had in the room waiting tht day! !congratulations to you and Ashish too!!muuuaaaahhhhh!!! i absolutely adore this post! happy anniversary to both of you..wish you many many beautiful years ahead..and as always you are looking gorgeous in the lehenga..i love the photographs..and love the poses he captured. our photographer was not so good(realizing it more after seeing your pics) and of all your outfits lehenga one is my favorite..i am a huge lehenga fan and wore three different ones for wedding functions..i can barely walk in a saree and dont know how to tie it..i like suits though..they are pretty comfortable but in saree i can juts stand and get clicked..i can't move..when are you back? happy anniversary tanvi :) :) may you have all many happy memories for your future. Needless to say you are gorgeous. I've loved the whole journey. I really appreciate you sharing all of this. congrats on your anniversary. Loved this post!!! Gorgeous trousseau, Gorgeous pictures, Gorgeous people! I'm younger than you..but phir bhi..I hope y'all celebrate many more anniversaries!! Awww..you look great Tanvi..The color of your lehenga and your eye makeup looks so pretty on you!! I'm with Sovina on this..I like lehengas the most too..I mean I love saris too but I still can't walk in them and am always fidgeting with it! Anyway, I loved your wedding week and am kind of sad it's over!! I enjoyed it soo much!! Happy anniversary once again!! Wish you two all the happiness in the world!! the first picture is indeed a favorite (am sure to all readers too). it's beautiful! wish you manymanymany more ! Tanvi! This is such a lovely post. Thanks for sharing it with us.You look especially lovely in the first picture. great pics tanvi.. ur lukin very very pretty in all of the pics. and ur hubby is luuking great too..,..
so much fun to remember all the events. And yes, another party is order! n u made a stunning bride! You look so beautiful as a bride! Love your outfit too!!!!! I love the fact you`ve worn blue and not the traditional maroonish-red! You looked absolutely beautiful! Your wedding lehnga is stunning!